Aniston, Jennifer — The Friends star, today’s guest on The Ellen Degeneres Show, told the host an anecdote of a recent chance meeting with fame-obsessed blogger Perez Hilton in a Hollywood garage. “I just said ‘Come here. Just talk to me for a second,'” Aniston told Degeneres. “I was like ‘Why are you so mean? '” Hilton reportedly responded by pulling a sharpie out of his pocket and drawing on Aniston’s face. Day, Groundhog — Consider this your must-read piece of the day: a British blogger over at Obsessed with Film has shown that the blog’s name isn’t just a clever title as he has tirelessly –and quite impressively — taken the time to figure out an estimate of how long Bill Murray’s character of Phil Connors is trapped in the small town of Punxatawny in Harold Ramis’ 1993 film Groundhog Day by figuring in how long it might take to become a master ice sculptor, an expert piano player and fluent in french, among other impressive feats. I won’t spoil the answer, but it’s definitely worth the read. 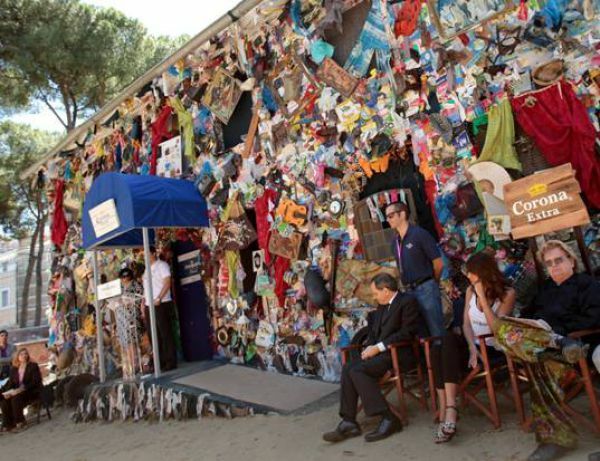 Hotel, Garbage — An exhibition in Madrid, Spain features a full, functioning “garbage hotel,” built completely of trash washed ashore by the ocean tide. The hotel’s designer, a German architect, says he hopes the building will prompt visitors to think about how much waste is generated by tourism. I don’t see why this is such a big deal. Here in the United States we’ve had “garbage hotels” for years. They’re called Ramada Inns. Johannson, Scarlett — Sources for Us Weekly have reported that actress Scarlett Johannson was recently seen reunited with soon-to-be-ex-husband Ryan Reynolds, where Johannson was allegedly doing quite a bit of crying. Upon closer inspection, however, it was discovered that the image of Reynolds was not real and that Johannson was crying uncontrollably at having to watch Reynold’s 2009 film X-Men Origins: Wolverine. Stripes, White — Rock duo Jack White and Meg White have decided to call it quits for The White Stripes after a teaming lasting almost fourteen years. Allegedly, the reason for the split is that Meg became incensed after discovering Jack had been recording albums behind her back with hundreds of other musicians. I think her commitment on Broadway prevented her from making good..After Scarlett backed out the magazine approached Christina to appear on the cover and announced that she had won the Women We Love survey on Esquires website. Curiously Scarlett was not on the list of possible choices..Of course Scarlett shouldnt be blamed if she had other arrangements that she had to honor instead of posing for Esquires cover. However we bet Christina isnt too happy to hear that she wasnt the magazines top pick..